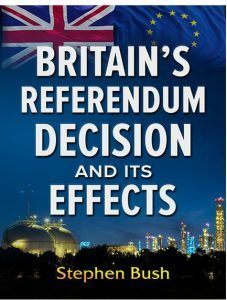 Download this illuminating study on Brexit by Stephen Bush here. It’s an invaluable guide to understanding Britain’s negotiating position with the EU. Your message has been successfully sent to Prof. Bush, he will respond shortly. It was not possible to send your message. Please try again. If the problem persists then please report an error to the webmaster. There seems to be some data missing and your question cannot be processed. Please try again. If the problem persists then pleasereport an error to the webmaster. Stephen Bush is Emeritus Professor of Process Manufacture and Polymer Engineering at Manchester University. Prior to Manchester, he served as senior research manager with ICI and ICI Europa Ltd. Professor Bush is a pioneer of Systems Technology and its application to the design, scale-up, and continuous improvement of industrial processes. Of particular salience has been his work in the fields of chloro-hydrocarbon and naphtha-derived chemicals, of synthetic fibres manufacture, and of fibre reinforced polymer composites. In the context of process manufacture, Systems Technology comprises an integrated set of experimental and mathematical methods based on the finite cell (FC) concept and the Flow, Kinetics, and Transport (FKT) equations. All scales of operation, from the laboratory to the full-scale, for improvement and innovation, are thus accommodated in a common scientific system of equations, parameters and experimental data. Over a period of 45 years, whilst at the Massachusetts Institute of Technology (MIT), Cambridge and Manchester universities, at Imperial Chemical Industries (ICI), and throughout his consultancy career, Professor Bush has refined the System’s underlying mathematical and experimental methodologies through applications to most of the world’s major petrochemical and polymer processes. The free-radical based naphtha cracking model: for ethylene, propylene, butylene plant design and operation at the full scale. The Fossett-Bush formulae for jet-mixing of fluids applicable to all scales of operation from laboratory to reservoirs and harbours. The jet-stirred reactor (JSR) family of FCs for laboratory measurements of the fundamental chemical reaction parameters. Chloro-hydrocarbon solvents and monomers: complex flow and free radical kinetics models for the design and operation of reactors at the full-scale for a wide range of industrial chemicals. The Kinpack© variable structure model software for the mathematical modelling of free radical, catalytic, and diesel combustion reactions in full-scale reactors and engines (includes the formation of NOx and carbon particulates). The development of the Approximate Implicit Method (AIM) for the rapid and robust computation of the FKT equations in Kinpack and in other software. Discovery and analysis of thermo-kinetic temperature and pressure oscillations on the laboratory and full-scales, and the design of control strategies to avoid them. The Process and Analysis Monitoring Systems (PAMS©) software for the control of product quality in multi-stream processes, with particular reference to the spinning and texturing of polyester and nylon fibres. The Self-Organising Principle: Formulae for the motions of long fibres dispersed in polymer melts and applied to the in situ creation of fibre lace reinforcement structures. The SAFIRE© family of long-fibre self-assembling reinforced polypropylene and polyethylene thermoplastic composites for pipes and mouldings, and their extension into SMARTFORM© self-adaptive composites. The VISCOR© family of thermoset fibre reinforced shrink-controlled polyester composites. The prize-winning Rollet© and Biokab© families of novel hollow-walled, rotomoulded polymer storage systems made in a single manufacturing operation.